Compared to millennials, our elders aren’t well versed when it comes to technology and smart devices. But how about giving them a gadget that will make them more independent in their retirement years. We always worry about the elders in our family like we do for the children. On other hand, the elders can be quite reluctant to the idea of depending on their children for some or the other work and prefer to do things themselves. Hence it would be quite worthwhile to share a list of gadgets that can help them with their daily tasks, on their own. We all know alarms are devices that abruptly wakes us from our slumbers each morning. But scientists have come up with alarm that keeps a check that the people don’t doze off while driving. There are two types of anti-sleep alarms. The first type of alarm is in-built into the car systems which makes use of sensors, cameras and other high-tech tricks to discern a driver’s fatigue and correct the problem accordingly. The second type of alarm fits over the driver’s ear and sounds an alert when the driver starts to fall asleep. Older people are tended to feel drowsy behind the wheel after a certain hour. The anti-sleep alarm will buzz in the right ear of the wearer it their head tips too far to the side. GE Personal Security gave the solution for wireless Alarm system. The GE Personal Security Alarm kit includes everything you need to secure your home, including a deluxe door alarm with a four-digit keypad and 3 independent window alarms. Delay in the door alarm to avoid false triggering. The alarm for door requires 3 “AAA” batteries and window alarm requires 4 “LR44” batteries. With aging process the vision of the people weakens and so at their retiree age they very much need to use the flashlight whenever they go out at night hours. Gifting them a head-mounted light would be the best gift ever. They can wear it on whenever they go out in the dark and keep their both hands free to have more balance and hold of the things. With age people tend to develop joint pains and the tasks like bending down to pick up things again and again becomes a tedious work. Especially people with knee problems faces a lot trouble in bending down. This telescopic magnet is in the form of flexible stick which can be extended and shortened. The magnet at the end help you pick up magnetic items. The telescopic magnet stick comes with different specifications and can pick up items of varying weights depending on their specification. The electric appliance for opening the lid of the can is not that good option for seniors because of the complications involved in using these appliances like charging, battery replacement, etc. But we still have this in market and you can give this one as a gift to the senior citizens with hand mobility issues. This is easy and comfortable to use with a sharp cutting disc and non-slip large handle which help in opening large cans in seconds. It is the useful tool while camping and can last for years. On top of it, it is very easy to clean it using detergents. Sometimes a lid is so stuck, no amount of muscle or willpower will loosen it. Opening such lids will be a very tedious task for arthritic hand and could end up in bad consequences. Hence, Automatic Jar Opener makes opening jars amazingly simple. Best of all it fits all kinds and sizes of jars from small to large. It is made with quality materials and built for long-term durability. Compact in design for easy storage. It has effortless push button opening system which don’t need any muscle strength. It has a one-year warranty and a toll-free call center to answer all kinds of questions. Gardening is among the favorite past time for our grandparents but it becomes difficult to accomplish the garden work when growing old. Garden Seat makes sure that the grandparents get the support that enable them to continue to enjoy the blissful benefits of gardening. The ergonomically designed seat subtly rocks with you as you bend and stretch. The base is curved in a way to reduce the strain on knees and lower back by providing a full range of motion. The height of the garden seat could be adjusted as per the feasibility and it can support up to 200 pounds. Something more to favor the people with joint pains and arthritis and who also love to play cards. There are lot many products in the market for us to select from to gift to our grandparents and let them continue to play the favorite cards game. As said, they are varieties of it. Among them one is in the form of wooden curved rack which was manufactured by CHH Inc. which is a manufacturer, importer and distributor of quality products including Traditional Games, Timepieces, Geographical Globe, Lead Crystals, as well as other fine gifts. CardCady designed a playing card holder to hands-free playing by giving it stand to place it on flat tabletop. It can hold up to 15 cards and was half the size of other playing card holder competitors. The real people who will be benefitted by this device will be the neighbors who will be disturbed by loud volumes of TV. There are some ailments that people tend to develop when they age or get old like low vision, mild hearing loss, joint pains etc. The good news is that now we have several TV listening devices that can help make TV watching easier and more enjoyable for everyone. Wireless TV headphones help to make TV sound more clear creating a direct wireless stream from the television to the wearer’s ears. It consists of two parts, a transmitter base that plugs into the headphone jack of the television and a headphone receiver that wirelessly picks up the signal and is worn by the listener. Snapfon always have seniors in mind while developing something new. The industry designed a cell phone especially for the seniors and even named it as ezTWO 3G senior cell phone. It comes in combination with the affordable cellular services plans to fit the individual needs of senior citizens. While designing the ezTWO 3G senior cell phone the company kept in mind that the seniors need something easy to see and use and which doesn’t focus on something smaller, faster, and more complicated devices. 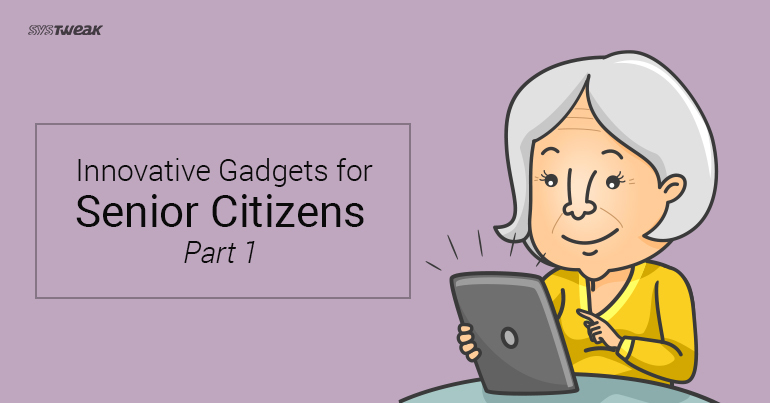 Big buttons, enhanced sound, easy to navigate menus, Bluetooth, hearing aid compatibility and exclusive SOS buttons makes it best fit for seniors. We know that Vacuum Cleaners are a must of every household but we also understand that controlling the vacuum cleaner is a bit difficult for old aged people. As the vacuum cleaner is a heavy machine to work and control. Robot vacuum cleaner could be referred as one of the great inventions. Vacuum Cleaner has come a long way from being a gimmicky, bulky wall-bumping machine to smart robots that cleans your floors unobtrusively. 5 Hidden Amazon Echo Features You Probably Didn’t Know About!